A look at growth in manufacturing and other sectors vs. the U.S. In light of 4,600 new California manufacturing jobs reported in July, we thought we'd take a look at how some of the largest job sectors were doing against the rest of the country since we began to come out of the recession in 2010. 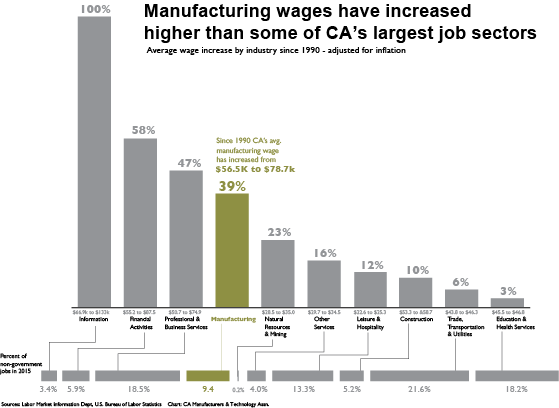 The CMTA chart below shows each sector's growth and average salary in both California and the U.S. It also shows the percentage of the private sector job base that each of these sectors account for in California. 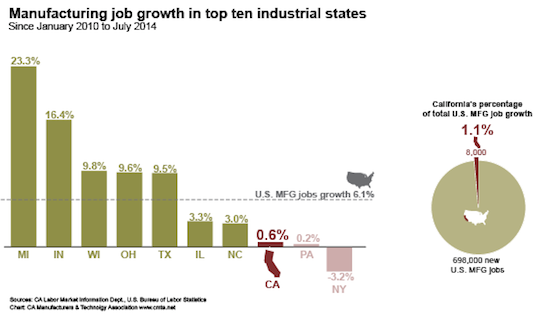 In total it shows our state needs to find ways to attract more manufacturing. Upticks like we saw in July are promising but California must keep it up. Click the image for larger PDF.